Since its inception, Ford has built a reputation for delivering solid technology to all of its vehicles. 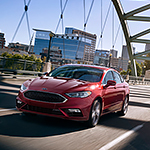 The Ford Fusion sedan exemplifies this tradition with the latest in innovative technology offerings, all designed to improve the driver experience. The available dual LCD SmartGauge with EcoGuide gives drivers a myriad of real-time data to improve the efficiency of the vehicle. The popular Waze app is now compatible with the Ford SYNC system, giving drivers the latest in crowd-sourced navigation services for a more seamless experience. The Ford technology experts at The Razzari Auto Centers are well-equipped to answer all of your questions about the innovative features of the 2018 Ford Fusion. Our team of professional and friendly associates is standing by eager to demonstrate to you all of the new technology available in this venerable sedan when we take you out for a test drive. We look forward to serving you today!